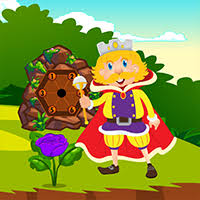 AvmGames - Avm Escape the Old King is another point and click escape game developed by Avm Games. This old king is unlike any other kings. He is active and he doesn't like sitting around. In fact, he goes out of his palace every other day to meet the other kings. However, this king is not that famous. The king from the other kingdom doesn't know him at all. He thought that the old king will invade their kingdom so he ordered his knights to capture the old king. The thing is, the old king didn't bring to many knights with him, just you. You didn't have the chance to defend your old king but you can do something to get him out of there. Only you can rescue the old king so you have to do your best to help him to escape. You have to look for the key so you can open the door of this palace. Or better yet, you must collect items that you can use to break the door open. Nobody has to get hurt. You came here in peace and in peace you will leave. Good luck and have fun! logically, it should be AILN...! alpha, where did you get maths? I did the Nila paper 2 X's and it worked. I know that 125 paper is for 5 digit puzzle but can't work it out? I thought I did that IE. ABC ECT> I had to do it twice to get it to open? Don't know what the stove is for?? Thanks AO I still have the paper though?? I can;t tell the color apart because of the tint Bummer. I gave up as I don't see any logic to this game at all? "combo stove colours with the 125 etc. paper"
for 5#code in S5: MIRROR!! !